I told myself I wouldn't do it. Don't we all? And then it happens. One day you look in the mirror or you hear the all too familiar words flood out of your mouth...I've turned into my mother. I'm pretty sure it's inevitable. It's going to happen. Just because. Because she's ingrained in us. Because we are a part of her. Because we once were inside of her. Because she created us (with a little help from our fathers, but only about 5 seconds worth ;)). So how could it not happen? But I'm starting to think it's not such a bad thing. My mom loved (and still does) with a love only a mother could give. I have the same love for Anna so it's only natural to act in some way like my mom. Also, my mom lives 8 hours away from me so when I'm reminded of her in the little things I do I smile. Though the distance is far she's still there, with me, in me. 1. I lick my finger than try to smudge off whatever is on Anna's face. Could be spaghetti. Could be dirt. Could be crusted boogers. (Yup, I said it. And if you're a mother too you should not be disgusted. You know you've done it too). 2. I try to give Anna "the look" after she's done something or is about to do something she knows she's not supposed to do. Still trying to perfect this. My mom's look is the best, even though she still tries to use it on my siblings and me and we just laugh at her. 3. We're driving and Anna starts to wine out of boredom I begin singing kiddie songs (wheels on the bus, old mcdonald had a farm, how much is that doggy in the window). 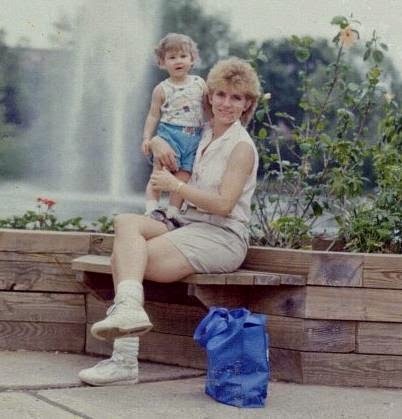 This was my favorite time with my mom when I was about 3 years old. Every morning on our way to daycare we'd sing together. I'm hoping Anna has the same fond memories I did with my mom of these times. 4. I'm playing with or doing Anna's hair. And just like how I was when my mom played with my hair Anna always tries to get out of it. She turns to me and says "DOP!" ("stop!"). Since I have naturally curly hair after every bath my mom would run Paul Mitchell mousse through my hair. I can still smell the coconut scent. I hated every minute of having my hair brushed, combed, put up, played with but I really do miss those moments, and I think my mom does too because whenever we're together (which isn't often because of the distance) she still wants to play with my hair. And most times I let her. 5. I put Anna down for bed. I sing the same lullaby to Anna as my mom sang to me. It was a simple song but very special because I felt like it was mine and hers. She'd rub my back while singing it and whenever she thought I was asleep she'd stop until I "twitched" and she'd start back up again. Now it's mine and Anna's lullaby. Of course there may be things I want to do differently than my mother did. We all have that. But I know for sure the reminders I listed above I'm proud to say I got from my Mama. She is a wonderful women, full of love, full of compassion, full of laughter and the ability to make us all laugh. Mom, I love you. Happy YOU Day!